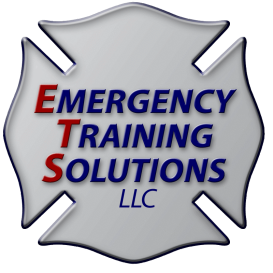 Our philosophy at Emergency Training Solutions, LLC (ETS) is simple; we believe education is key in maintaining safety and ensuring effective emergency response. We are dedicated to providing quality onsite training to the emergency service industry.Our team consists only of experienced firefighters and fire service instructors. We strive to provide well organized training sessions to make the most of our limited time with our personnel. We do not believe in a “one size fits all approach” and will adapt the training program to the specific needs of your organization to increase overall effectiveness. Please contact us if you are interested in hosting a class, or want more information. Copyright © 2000-2016 Emergency Training Solutions All rights reserved. PowerPoint® is a registered trademark of Microsoft Corporation in the United States and/or other countries. Adobe Acrobat® is a registered trademark of the Adobe Corporation in the United States and/or other countries.